The HDX 76L Storage Tote is the perfect solution for storing items in the attic, garage, basement, closet or anywhere else that'll keep your personal items out of your way. For added convenience, you can stack totes on top of one another to save space. The ocean blue color of the storage tote complements many home decor styles. The strong durable 76l tote is ideal for use in the home office or garage. This tote is stackable and features snap lock lids. Formed lids make it easy to stack other totes on top. The Latchmates+ takes organization to a new level, with hinged latches an accessory tray and a carry handle perfect for storing everyday items like tools and gardening supplies. Modular & Stackable, quality, clear appearance , clean lines and simple design, brings a polished look to your storage area. The Sterilite Set of (2) 16 Quart Storage Boxes is a convenient two pack of the popular 16 Quart size, and is ideal for a variety of basic household storage needs. It features a clear base that allows contents to be easily identified and an opaque lid that snaps firmly onto the base to keep contents contained and secure. This storage box is ideal for storing small items around the home and fits conveniently on 16inch wire closet shelving, making it ideal for organizing and storing accessories, clothing and crafts in the closet. Stack same size containers on top of each other for efficient use of vertical storage space. Storage Tote in Ocean Blue, 76 L The HDX 76L Storage Tote is the perfect solution for storing items in the attic, garage, basement, closet or anywhere else that'll keep your personal items out of your way. For added convenience, you can stack totes on top of one another to save space. The ocean blue color of the storage tote complements many home decor styles. 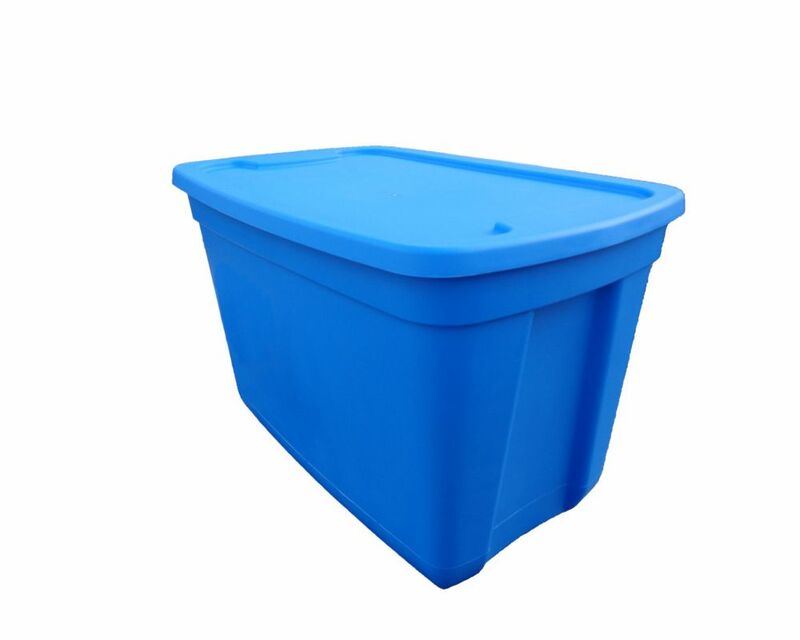 Storage Tote in Ocean Blue, 76 L is rated 3.6 out of 5 by 7.